Designed to replace the OEM lens mount in Mitsubishi H model (HC, HD etc.) laser cutting systems which employ 2.0″ diameter lenses. The lens mounts can be used interchangeably for both 5.0″ and 7.5″ focal lengths. These lens mounts are designed to replace the OEM lens mount in Mitsubishi H model (HC, HD etc.) laser cutting systems which employ 2.0″ diameter lenses. The lens mounts can be used interchangeably for both 5.0″ and 7.5″ focal lengths. 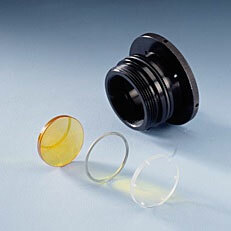 ICL’s lens mounts for Mitsubishi H model cutting enable use of Lens Savers® window under high pressure. The lens mounts replace the OEM lens mounts. The Lens Saver® mount is similar to the OEM mount and has the same exterior geometry, but we have added a cavity on the work (cutting) end for the Lens Saver® windows. The mount also allows the assist gas pressure to pass into a cavity between the Lens Saver® window and the lens, which results in the pressure on both sides of the window being equalized. The assist gas passes through holes drilled around the perimeter of the window outside of the optical path of the laser beam. ICL’s patent pending pressure equalization method prevents the window from breaking by providing an environment in which the pressure on both sides of the window is equalized.